This post is sponsored by the lovely people at Vitamix who sent me the Vitamix Professional 750 Series to play with. In return I agreed to post an honest review! We are well into soup season now. With temperatures in London resting firmly around 3C I am all about warm, comforting bowls of soup when I get home from work. It’s no secret that my job is pretty hectic. Some nights I don’t get home until way past “normal” dinner time and when I do I want something quick, easy and with minimal fuss. With the added stress of the recent house move, we’ve been heavily relying on microwave meals and take-aways to provide dinner which really hasn’t been good for our waistlines! 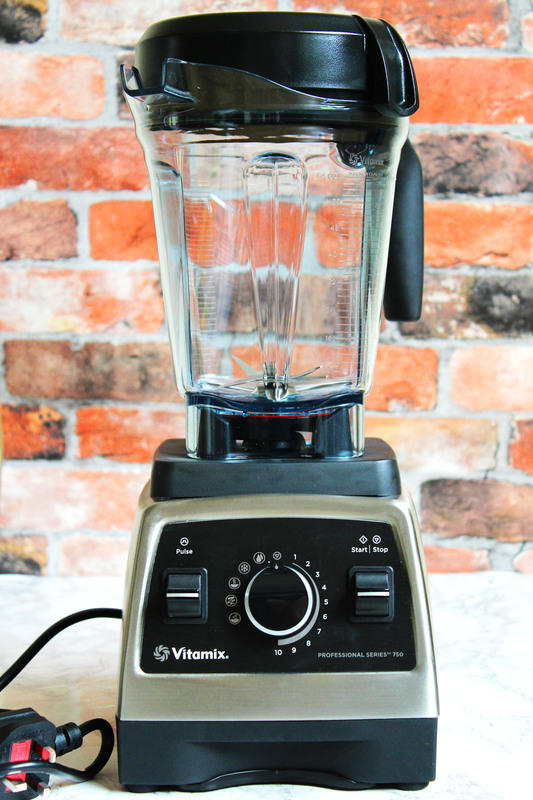 When I received an invitation to try a Vitamix Professional 750 Series Blender, it couldn’t have come at a better time! The Vitamix has five pre-programmed settings: one for smoothies, one for hot soups, one for frozen desserts, and one for purées. Wondering what the fifth is? Well that’s the automated self-cleaning function! That’s right, not only is this clever bit of kit going to make you a warming bowl of soup, it’s also going to clean itself after. How good is that! Making dinner has never been easier! 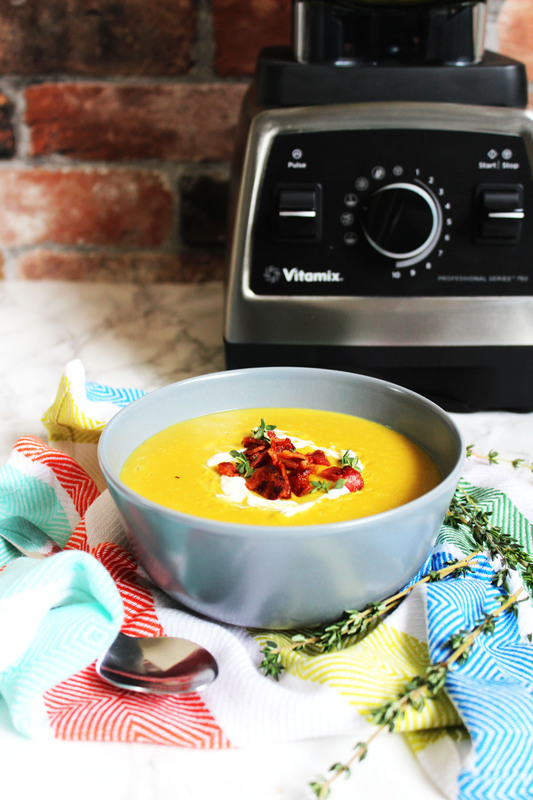 You may be a little dubious (like I was) that a blender can make a bowl of soup from scratch. But, the Vitamix really is that clever. The famous blades whizz round so fast that you can get it to a simmer just by using the friction of the blades alone, when you use the ‘Hot Soup’ function the blades spin so fast you really do end up with a steaming hot bowl of soup! Some recipes will take to the blender better than others. If a recipe calls for roasted vegetables (this Roasted Tomato Soup) you can’t skip out the roasting stage. BUT, what it can do is save you the mess of roasting the veggies, blending the soup, and then heating it on the hob. Just roast your veggies and the Vitamix will do the rest. This Chestnut and Parsnip Soup, however can be made from start to finish in the blender. (Ok, the crispy bacon bits do require a little more effort and some minimal washing up but they are optional). I’ve also tried my spicy black bean soup, and my quick and easy peanut soup in the Vitamix, both of which work a treat! So now I’ve had a chance to play with the blender what did I really think? Pros: its super easy to set up and start using. Just place the blender jug on top of the base and off you go! This is one super powerful blender with lots of cool features. Being able to heat up food makes life so much easier. I’ve always associated blenders with extra washing up but being able to make soup in just one gadget that has a self-cleaning function has made me completely change my opinion! It’s also a lot quieter than I was expecting when using the low speed settings. My old blender was a noisy machine that woke up the whole block of flats when I made a smoothie on a Sunday morning. Now I can blend in peace knowing my strange eating times aren’t going to wake up our neighbours! The power behind the blades really is phenomenal too. Again, my old blender really struggled with even the simplest of tasks. Frozen fruit was difficult and nut butters almost impossible! This will blitz anything in seconds. Wait…wasn’t there a viral website back in the day that blended random stuff? I wonder if they used a Vitamix… But I digress. With this blender you are able to get the smoothest of finishes. Amazing. Cons: I’ll be brutally honest here. There is one flaw that won’t be insignificant for most people. But there is only one, and that’s the price. With a price tag of £650 this isn’t going to be for everyone. Personally I spend way more on kitchen gadgets than I should and I’m sure many foodies wouldn’t bat an eyelid at the cost. It is worth the money. Enough about the blender. Lets talk about this soup! I’ve deliberately gone for seasonal ingredients. You’ll find parsnips at their best between October and March in the UK. Supposedly the best tasting parsnips are harvested after the first frost. They are a hardy winter vegetable that goes perfect in this winter soup. Chestnuts are another ingredient that is at its best this time of year. The nuts drop from the trees between mid-September and mid-October so if you’re looking for fresh Chestnuts now is the perfect time! You can of course use pre-cooked vacuum packed chestnuts which I’ve done here. Unfortunately I haven’t been able to find fresh chestnuts in our local grocery store or supermarket but the pre-cooked are super convenient and help to keep this a quick and easy recipe. Put parsnips and chestnuts together and you have a quintessential, British, seasonal soup! It almost tastes like Christmas! Put all of the ingredients minus the bacon into the blender jug (liquids first followed by the solid ingredients). 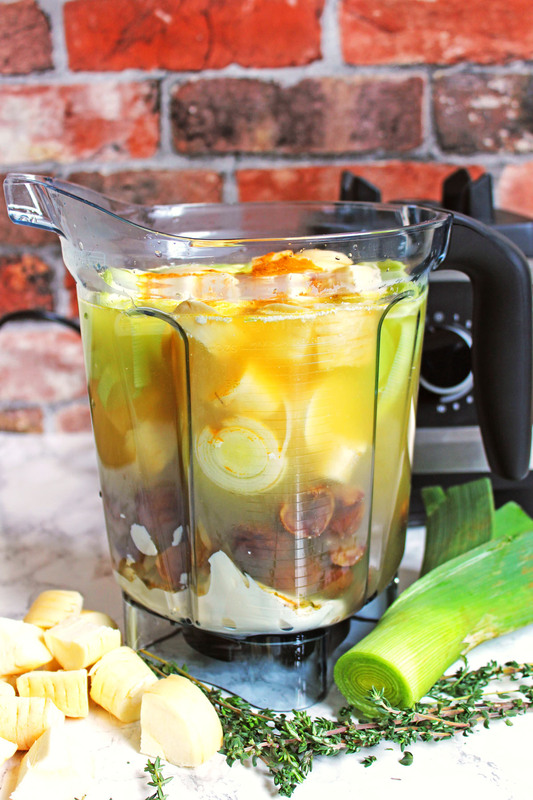 Place the blender jug on to the base and select the 'Hot Soup' function. Start the machine and let the programmed cycle run (roughly 5 minutes in total) by which point the soup should be silky smooth and steaming hot! Serve the soup with a drizzle of creme fraiche, a sprinkling of the thyme and the crispy bacon bits. If your blender doesn't have the hot soup function, start on the lowest setting ('1') and slowly increase (up to '10') until the soup is smooth. Heat in a pan as required. Top tip: The crispy bacon bits are only sprinkled on top of this recipe – think of them as a seasoning or a garnish! This means it can easily be made vegetarian – which my other half is very thankful for! I’m so in love with the Vitamix it is now taking pride of place on my kitchen counter! What will I make next? I’m thinking festive nut butter, Sunday morning smoothies, big batches of salad dressing for workday lunches and of course more soup! So keep your eyes peeled! Well this looks delicious. I’ll have to leave the bacon bits off as a veggie. What would you recommend instead? Crispy onions or toasted nuts maybe? Hey Rob crispy onions would definitely be my preference. Will have to do that for the OH next time o make him it (hes veggie too) toasted chestnuts would also be awesome! Your soup sounds delicious – I love parsnip in soup! It is delicious. Until Santa brings you a vitamix you can always roast the veggies with a little oil in the oven first. Once soft then chuck them in your regular blender and blitz until smooth. You’ll then need to reheat on the hob. Hmm I’ve always been interested in vitamix, I’ve heard they’re great. This soup looks great and as it gets colder I really do want more soup. I’m going to try your recipe. It sounds like fall, to me! I’m glad you like it! You can’t get more seasonal than this soup that’s for sure! Do send me a pic if you make it! Bacon is my favorite. Parsnips are a close second…so, basically, this looks like soup perfection! Can’t wait to try it out!!! Wow, ideal recipe for you then Sarah 😛 enjoy! Such amazing flavours in this soup Emma. I adore the sweet flavour of chestnuts and parsnips together in a savoury soup. Need to get my soup making apron on for this! Hahaha good to hear you’ve had the Vitamix for so long and still love it 🙂 I don’t think I will ever get bored of it! Power blenders really are amazing pieces of kit that you wonder how you ever lived without!!!! Your soup looks and sounds incredible… crispy bacon on top… lordy be! Genuinely Katie – both the other half an I have wondered what we did before! Soup is a favourite of ours and is now ten times easier to make!